Today is international #CochlearImplantDay. If you’ve not heard of cochlear implants, they are an amazing technology that enables an increasing number of profoundly deaf children and adults to ‘hear’ sound, and so learn to communicate primarily by speech (often supplemented by lip-reading and, in some cases, use of sign language). The technology and medical science involved is really quite extraordinary. 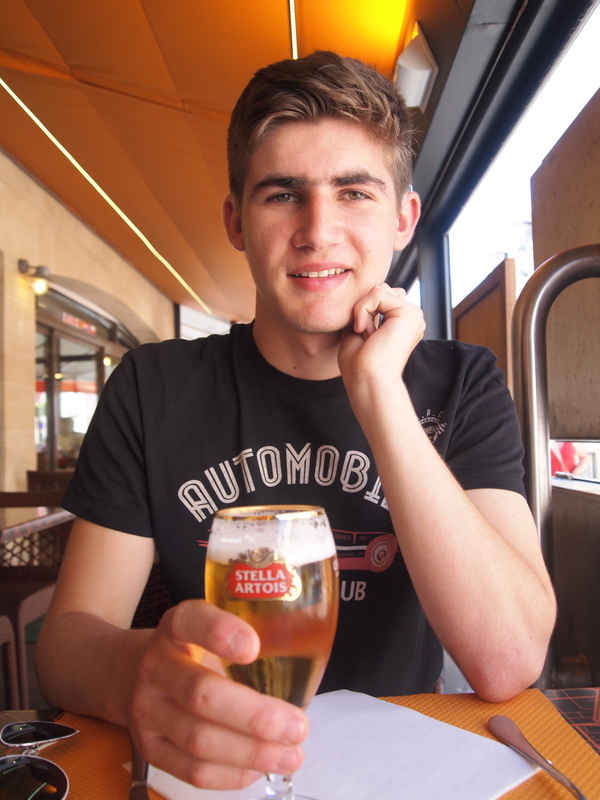 My son Sam, now 18, has been a cochlear implant user since he was two, having been left profoundly deaf by severe pneumococcal meningitis in infancy. And, along with other families, we have been asked to use today to demonstrate the difference that cochlear implants have made to Sam’s life. So, over the last few weekends, Sam and I have had a chat about it. And here is a summary of what Sam said, with some photos from the last 16 years of Sam’s cochlear-implanted life. Sam says that the best thing about having cochlear implants (and so being able to use his admittedly less than perfect speech as his primary means of communication) is that he can enjoy interacting with pretty much anyone he meets (well, as long as they speak English, and are not Jacob Rees-Mogg, David Davis or Nigel Farage). Sam is a fluent user of sign language (BSL), but that’s not much help if the person he’s trying to talk to does not sign. And only 0.02 of the UK population do sign. So this, for example, is Sam with a (non-signing) pirate he befriended in Turkey in 2013. 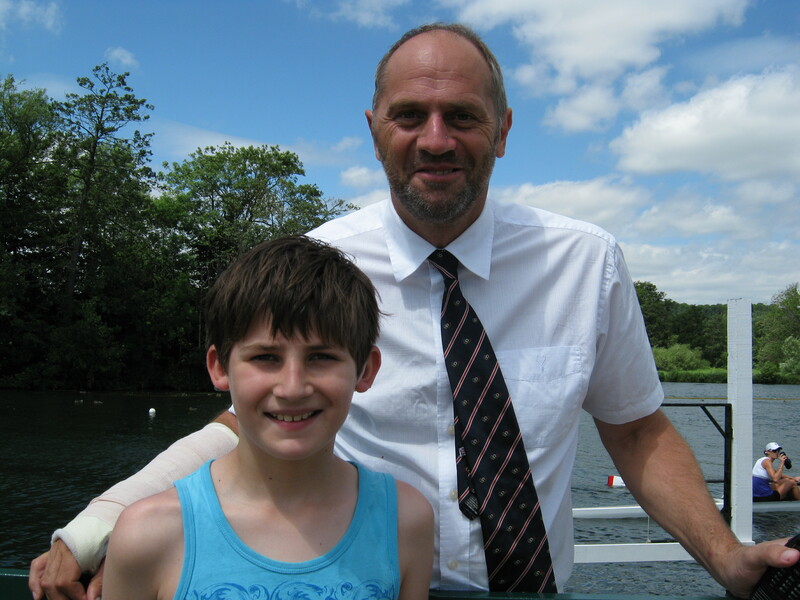 And this is Sam with five-times Olympic champion (Sir) Steve Redgrave, with whom Sam had a nice little chat after we bumped into him at Henley regatta in 2010. As you do. Steve had recently fractured his wrist (and cheekbone) while trying to cycle 3,000 miles across the USA for charity. So, Steve and Sam swapped hospital stories. As you do. 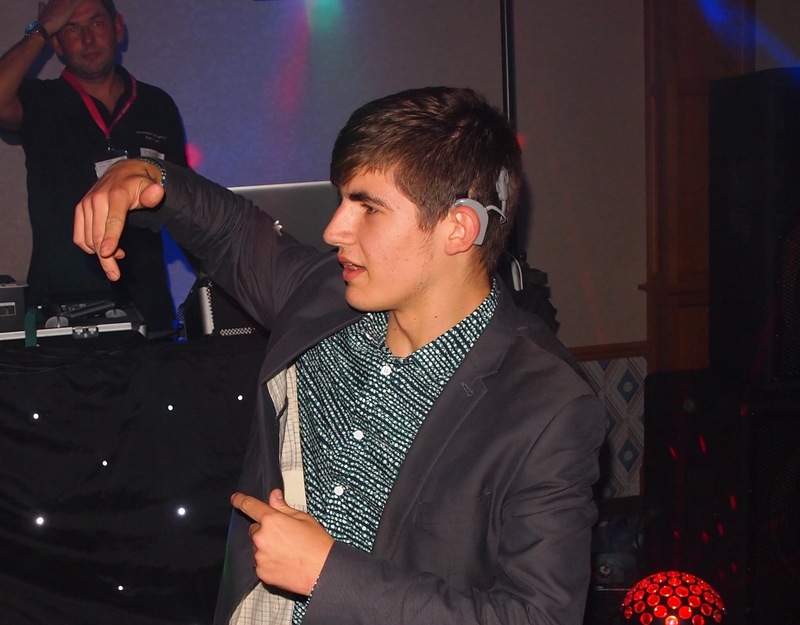 The next best thing about having cochlear implants, says Sam, is being able to enjoy music. Which in turn means dancing. Like his Dad, Sam has become something of a dance floor legend, with his move-perfect performance of all three minutes and 40 seconds of PSY’s Gangnam Style in particular attracting huge crowds of admirers. This is Sam throwing some shapes at Alton Towers (me and The Specials came later). 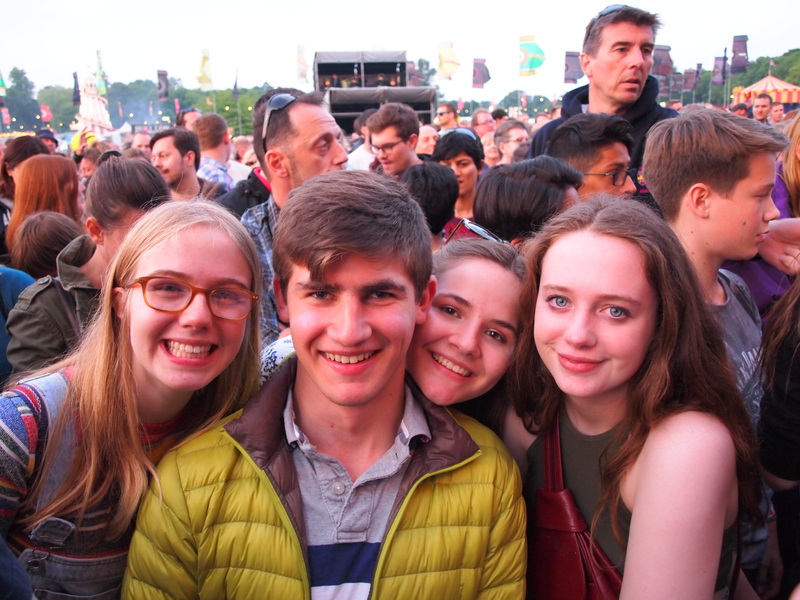 And this is Sam about to enjoy Katy B and Duran Duran with his sister Neisha and (hearing) mates Lucy and Kate, at the Common People festival in Oxford, in 2016. Another thing that Sam says he likes about having implants is ‘hearing the roar of the crowd’ at sporting events. 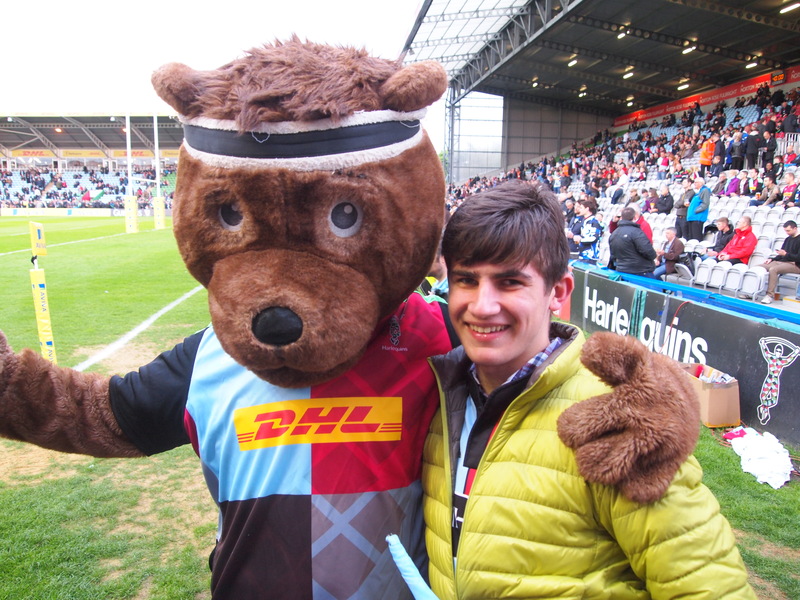 So, for example, Sam loves laughing at all the Harlequins fans moaning about how useless the Harlequins players are as we watch them lose, again. 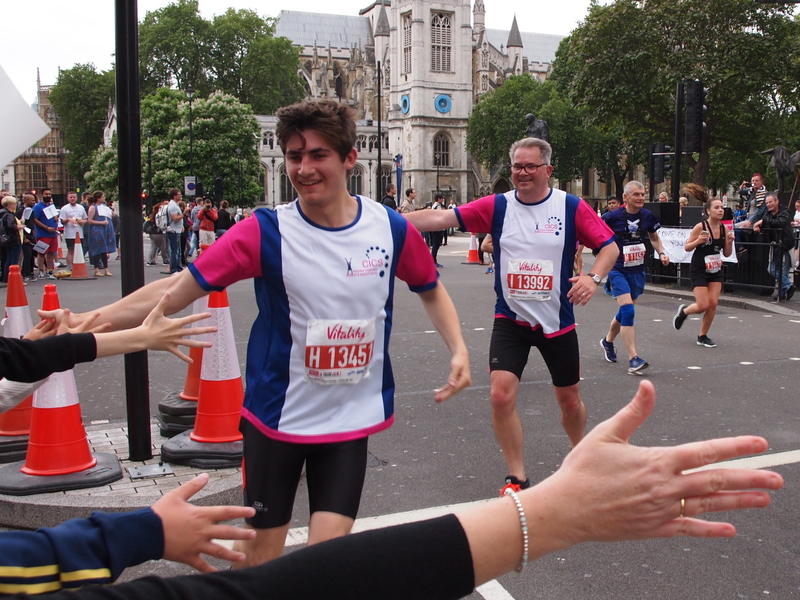 On 15 July this year, Sam’s younger sister Neisha will be joining us as we run the 10K to raise money for the Cochlear Implanted Children’s Support Group (CICS), from which we have received so much support and guidance over the years. And we would be delighted if you could sponsor us by visiting our fundraising page. No doubt Sam would be having a great life without access to sound, as a user of sign language only – he has some great friends who communicate primarily by sign. But Sam and I are deeply grateful to the NHS – and all the brilliant surgeons, doctors, audiologists, speech & language therapists, and teachers of the deaf along the way – for giving Sam the opportunity to enjoy the world in ways that would otherwise not have been available to him. So, we are definitely going to celebrate #CochlearImplantDay. With a beer, maybe. Probably. This entry was posted in Disability and tagged Cochlear Implants, deafness, Disability, hearing loss. Bookmark the permalink. What a lovely story about your son! I’m jealous of him meeting Sir Steve – my rowing claim to fame was accosting Katharine Grainger while I was working on the National Lottery Awards studio show in September last year. How are you keeping? All motoring on nicely in the office? Hope you’re very well indeed. I don’t think I’ll ever forget the tour of the HoC you gave me on my last day in August. For then and now, thanks again.